It's mid week again and for us in Singapore, it's one more day to the long weekend since it's a public holiday on Friday to celebrate Good Friday. As much as I would like to catch up on some rest over the weekend, it's going to be tough, cause it's another weekend packed with activities with my loved ones. Will probably try to get as much rest as I can these two days so that I will be recharged for the weekend! I have another indie brand of nail polish that's new not only to me but Nails Talk for today. Lynae Zebest, creator of Fanchromatic Nails came out with idea in late 2011 and starting selling her creations on esty in mid 2012. 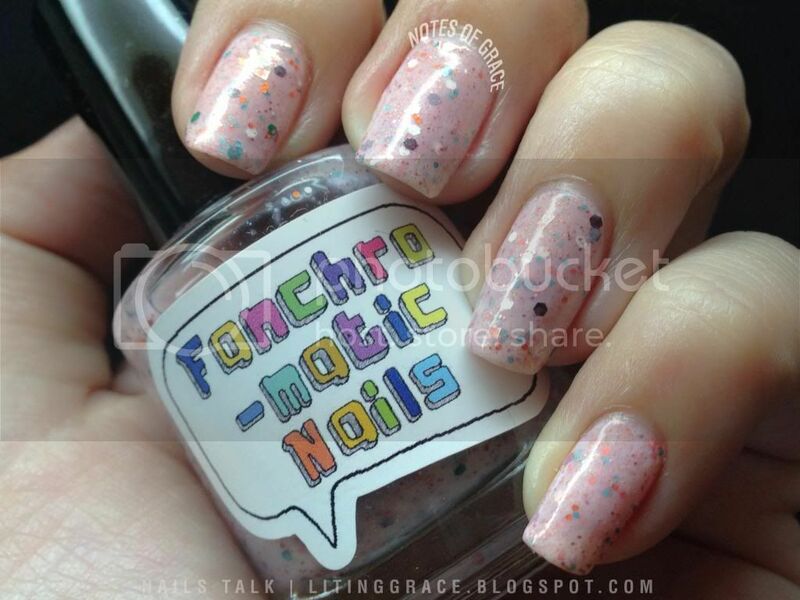 Fanchromatic Nails polishes are hand blended from raw ingredients and are vegan, cruelty-free and toxic-3 free. 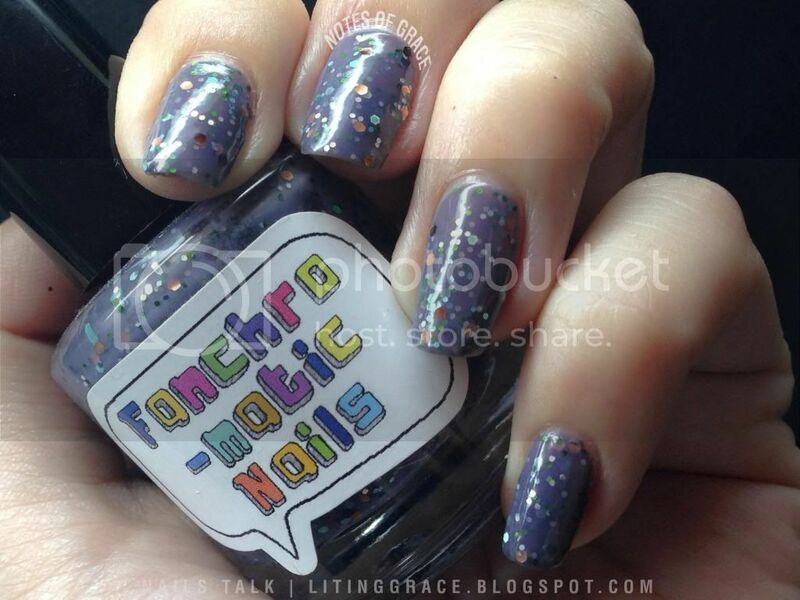 Being a fan girl at heart and believing in expressing ourselves through color, Lynae gets her inspiration for Fanchromatic Nails polishes from her favorite books, movies, TV shows, comics and much more. A while ago, Annette from Shoppe Eclecticco started stocking Fanchromatic Nails on her web store and after reading the review by Susan from The Subtle Shimmer, I decided to try out Between Two Worlds and Little Rowan. Between Two Worlds from the Strange New Worlds collection is a polish inspired by one of Lynae's favorite character in Star Trek. It's a soft purple polish with a jelly base filled with green, silver, copper and brown glitters. I needed three coats to reach opacity and had no problems with application. No fishing of glitters was required which is a huge bonus! I do not have anything like this in my stash and I really like the color combination of this. Taken under daylight lamp, no flash. Next, we have Little Rowan from the Summerisle collection. This was inspired by the The Wicker Man, a cult film from 1973. Little Rowan is a sweet milky pink polish with bits of gold shimmer, copper metallic flakes and a mix of orange, pink, white, blue, green and brown glitters in various sizes and shapes. Again, I required three coats to reach opacity and had no problems with application. Most of the time, I'm wearing dark colors so this is a palette cleanser when I want to take a break from the dark colors and yet want something fun. 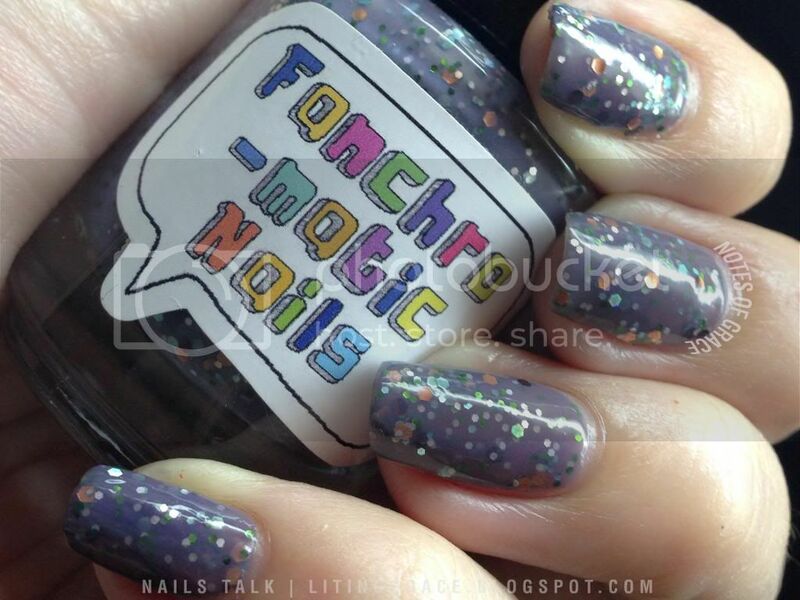 Fanchromatic Nails is available through Shoppe Eclecticco with international shipping available as well. 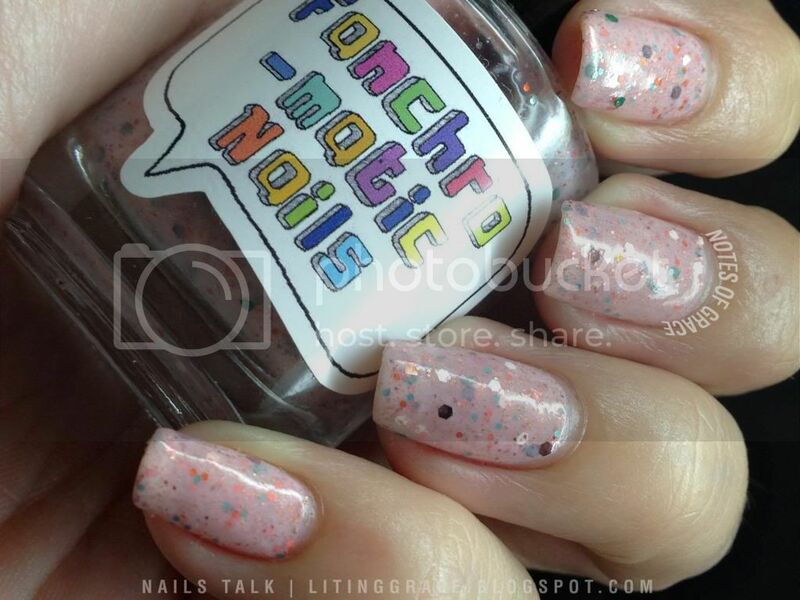 You may also purchase them from Fanchromatic Nails Esty store which also provides international shipping. For the latest updates and news on Fanchromatic Nails, you may also follow Fanchromatic Nails and Shoppe Eclecticco on Facebook. Before I end today's Nails Talk, I also have a great news to share! Annette has kindly offered a 2% discount for my readers when you shop at Shoppe Eclecticco! All you have to do is to key in the discount code "NOG2PC" before you make payment. So the more you buy, the more you save! Other than Fanchromatic Nails, there is a wide range of indie polishes available on Shoppe Eclecticco, so do check it out. That's all I have for today and I hope you guys have a great Wednesday. Ciao!